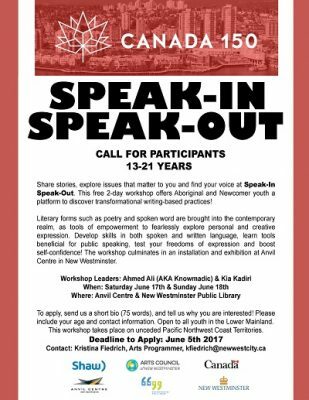 The City of New Westminster, in partnership with the Arts Council of New Westminster, and with funding provided by the Canada 150 Fund and a Shaw Canada 150 Initiative grant, has a fantastic opportunity for Aboriginal and Newcomer youth, aged 13 to 21, to participate in a free 2-day workshop! Share stories, explore issues that matter to you and find your voice at Speak-In Speak-Out! This free 2-day workshop offers Aboriginal and Newcomer youth a platform to discover transformational writing-based practices. Literary forms such as poetry and spoken word are brought into the contemporary realm, as tools of empowerment to fearlessly explore personal and creative expression. Develop skills in both spoken and written language, learn tools beneficial for public speaking, test your freedoms of expression and boost self-confidence! The workshop culminates in an installation and exhibition at Anvil Centre in New Westminster. Applicants will participate in a free 2-day workshop with special guests Ahmed “Knowmadic” Ali and Kia Kadiri, Saturday June 17 (10:00-1:00) and Sunday June 18 (2:00-5:00). Workshops will take place at Anvil Centre and the New Westminster Public Library, and will culminate in an installation and exhibition at Anvil Centre in 2017 (optional, dates TBA). Applicants must identify as First Nations, Newcomer or immigrant youth, aged 13 to 21. Spaces are limited: Maximum 24 participants. Please encourage your students, participants, and youth to apply today! Kia is a passionate Hip- Hop artist. This passion for music, rap, and poetry makes her extremely productive as a workshop leader, and engages even those participants who are shy to perform. Kia loves sharing the gift of words! The goals of her workshops are always to help youth build self-confidence, and connect to their cultural identities, using music, rap and poetry. She enjoys helping them express their ideas, communicating struggles that they face, addressing issues in their communities, and most of all having fun while they learn new skills. Kia is warm, welcoming and energetic, which makes her a magnet for adults and children. She demonstrates a good sense of the energy of the participants, and has the ability to shift gears quickly in response to their engagement.